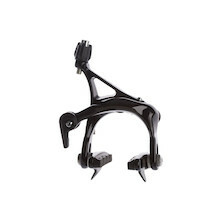 Caliper brakes are standard issue on road bikes and have been an urban bike mainstay for many years. With the recent introduction of disk brake equipped road bikes and more recently hydraulic equipped drop bar bikes that seems likely to change. But until that happens we'll continue to offer these for urban/touring bike riders who don't need the extra stopping power that cantilevers, V-brakes and discs have to offer. If you need ultimate stopping power and have a bike equipped with suitable mounts then check out our disc and cantilever brake sections.